Fourth Row Center: Film Writings by Jason Bailey: On DVD: "The Siege"
In the months after the 9/11 attacks, Blockbuster Video singled out a few recent titles and branded them with a sticker, which read: “In light of the acts of terrorism on September 11, 2001, please be advised this product contains scenes that may be considered disturbing to some viewers.” One of the stickered films was The Siege, Edward Zwick’s 1998 action thriller. The sticker was symbolic, in a way, for Zwick’s film; after that Tuesday in September of 2001, it would never be viewed in the same way again. It wasn’t a mere case of pre- or post-9/11 mindsets. It’s that The Siege, from its broad strokes down to individual lines of dialogue, now looks like a strange predictor of not only the kind of attacks that would define the “war on terror,” but the legal and moral debates that would follow. So a 2009 viewing of The Siege is a tricky matter. From the looks of the final product, poor Ed Zwick was just looking to make a slick, professional piece of tense craftsmanship that was, perhaps, a little more thoughtful than the cartoony shenanigans of pictures like True Lies or Executive Decision. He ran into trouble even upon the film’s release—it was protested by the Council on American-Islamic Relations and the American-Arab Anti-Discrimination Committee, among other groups, who objected to the film’s notion that fundamentalist Muslims might use their religion as justification for terror attacks inside the United States. Yeah, imagine that. (In fact, one of the film’s major accomplishments is how succinctly it argues against presuming guilt and complicity based on nationality and religion; those who protested it—most of whom, of course, hadn’t seen it—missed the entire point.) It’s just as difficult now to watch the film in a vacuum—you end up playing the analogy game throughout, figuring out if this character is supposed to be bin Laden, if this incident is most like WTC, which act of late-90s terrorism those Clinton clips in the opening credits came from. But if you can put on your blinders, how does the movie hold up? So-so. A brief prologue shows us that the bombing of an American army barracks overseas has led to the detainment of Sheik Ahmed Bin Talal, a bin Laden-like figure. We then go to New York, where Anthony Hubbard (Denzel Washington), a special agent with the FBI’s terror task force, and his partner Frank Haddad (Tony Shalhoub) are called out to a bomb threat on an NYC bus; a simple paint bomb explodes inside, but the office gets a fax that reads “Release him.” The circuitry of that paint bomb seems to be of interest to Elise Kraft (Annette Bening), a CIA agent who’s just chock full of secrets. The paint bomb turns out to be a warm-up (or warning)—soon after, a real bomb blows up a bus in front of Hubbard, and multiple bombings in the city follow (even after Hubbard and Haddad seemingly take out a Brooklyn cell). In an ingenious follow-through to a nightmare conclusion, the President declares martial law, and an army division led by General William Deveraux (Bruce Willis) seals off Brooklyn and tosses all of its young Arab men into a de facto internment camp. Just as modern viewers breathe a sigh of relief that we didn’t go that far, Hubbard and Kraft hone in on a suspect who may know when and where the next attack will take place, and General Deveraux stands in a room with them, trying to decide the most effective way to torture him. Hey look, it’s that ticking time bomb scenario we keep hearing about, and Washington’s impassioned plea for restraint does not sound like a speech from a screenplay that’s over a decade old. And look at that, I’m off the topic of the film again—you can see how difficult it is to stay on task with The Siege. Throughout the picture, Zwick proves himself a skilled, professional filmmaker; he builds an atmosphere of dread and tension in an early scene where Hubbard and Haddad are trailing a suspect (a young Aasif Mandvi, currently on The Daily Show), and the bus standoff scene is superb on all fronts. But his direction is occasionally too slick for the heady subject matter, and the high-gloss action sequences don’t always coexist easily with the high-minded intellectual stuff—we have to shift gears a lot (this would become a much more serious problem in his later films, like Blood Diamond). And his screenplay, written with Lawrence Wright and Menno Meyjes, is awfully thin. Some of it seems to want only to hum along on a crime-procedural level, and much of that material is too pat and predictable; it plays, in places, like a particularly well-case episode of Law & Order. The dialogue is mostly terse and serviceable, though some of it (particularly Bening’s) clangs with false notes. And while the ending is as satisfying as we can hope for in this kind of a story, the final face-off between Washington and Willis (whose early complexities give way to Cheney-like villainy in the third act) is perhaps a bit too easy and simple-minded. 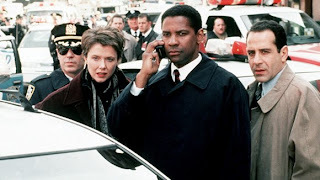 Washington turns in a finely tuned, memorable performance—Zwick is a director who often gets good work out of him (their previous collaborations were Glory and Courage Under Fire), and he has some terrific moments (particularly a scene in which he declares, chillingly, “This is New York. We can take it,” as beepers are going off around him with news of another attack). Bening’s steely characterization is interesting, but she’s saddled with some unfortunate lines and impenetrable motives; the screenplay keeps changing its mind about her character (and having other characters take cheap shots at her), and her turns get tiresome. Willis (who can be a good actor) would seem a nicely subversive choice for the surrogate villain role, but Zwick doesn’t have him do much but speak softly and look smug. Tony Shalhoub is terrific, however, and sharp-eyed fans of The Wire will spot Lance Reddick in a key role and Wood Harris in a one-liner. Editing is sharp and the film is impeccably shot, full of vivid imagery both intentional and unintentional (as in a scene where the aftermath of a building bombing bears an eerie resemblance to Ground Zero). In the years since its release, The Siege has become a more relevant and political film than its makers ever could have imagined. Its uncanny predictions of terrorism in the third millennium and the sticky moral questions therein have lent it an immediacy (and curiosity) surely unintended. But taken on its own terms, it’s a decent if unexceptional thriller, balancing strong performances and well-executed set pieces with some second-tier screenwriting. "The Siege" was recently released on Blu-ray.